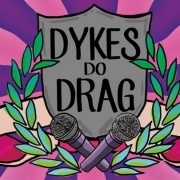 Dykes Do Drag are queers of all genders and orientations, celebrating an expanding continuum of gender expression and performance in the Upper Midwest for 16 years. This edgy performance art cabaret features the Twin Cities best as well as newcomers in traditional Drag, burlesque, live music, boi-lesque, modern dance, video and visual art, and lip synching in enticing and exciting hilarity. I have two pairs of tickets to give away to the April 18th show! To enter, use the raffle form below. Please use your full name for will-call purposes. Two winners will be randomly selected and notified via email.